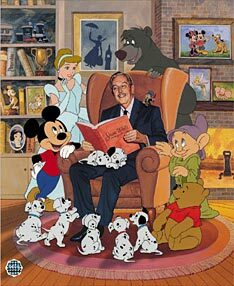 This nostalgic edition captures a rendering of Walt Disney by famed Disney artist Paul Wentzel as he reads the treasured tale “Snow White” to some of the most beloved and enduring characters of all time; Mickey Mouse, Dopey, Jiminy Cricket, Baloo, Cinderella – 12 characters in all. In the background, the shelves of Walt’s study are adorned with reminders of Walt’s classic creations – Tinker Bell, Mary Poppins, The Casey JR Circus Train, Dumbo and many more. One of the most unique sericels ever produced, in honor of one of the greatest innovators this country has known, Walt -“The Great Storyteller” is a memorable moment with the legend who started it all.